I think every party deserves its’ own snack mix. I mean, I’m a huge fan of party mixes and frequently buy them. I like to be able to grab a handful and get a few different snacks. Some of my favorite things in a party mix are the pretzels, cheese puffs, and the round of rye. 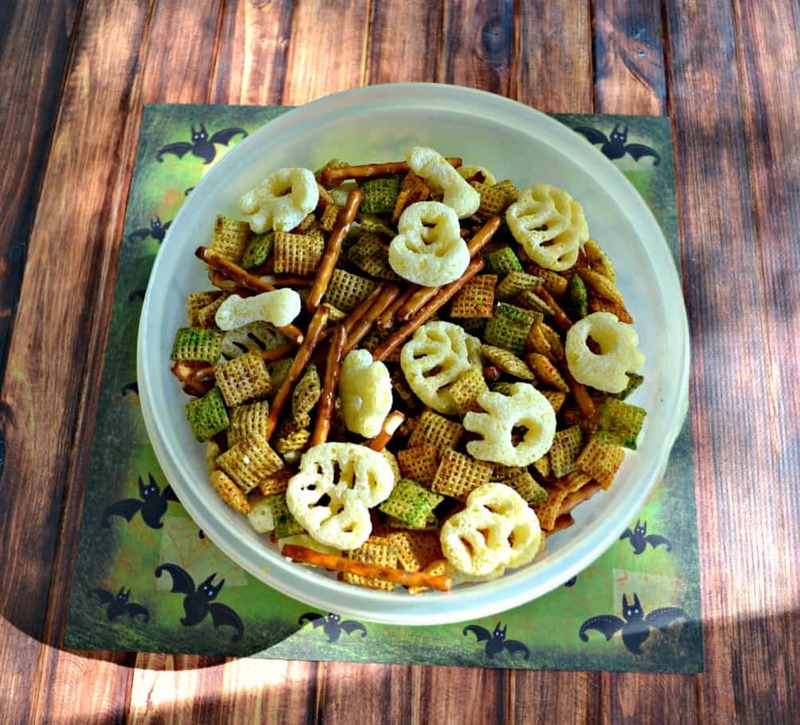 I thought it would be fun to make a party mix for Halloween. I searched the shelves looking for fun snacks to add to the mix. In the end, I only ended up choosing 3 simple snacks to add to my mix. 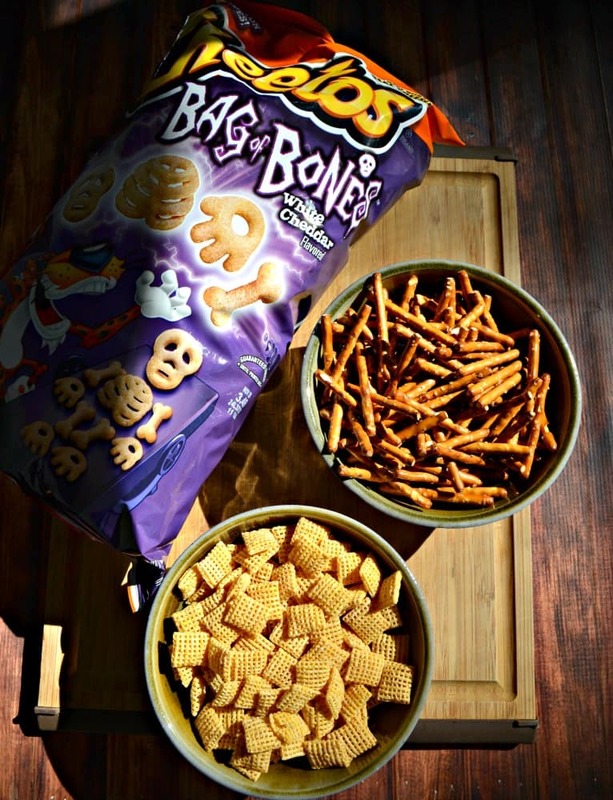 I picked Cheetos Bag of Bones because it would add a bit of crunch and cheese to the mix as well as “bones” for Halloween. Next I picked corn cereal because every party mix needs some type of cereal. Finally I chose pretzel sticks to add for saltiness. I know this probably doesn’t sound like a Halloween mix besides the Bag of Bones Cheetos. I thought that too but I couldn’t find any other savory snacks to add to the mix. What I ended up doing was melting the butter in 3 batches and adding food coloring to each batch. This turned the corn cereal orange, green, and purple for Halloween. The next thing I did was to flavor the party mix. I initially baked the pretzels and the corn cereal in the oven but I found the pretzels got soggy. So on the next attempt I only baked the corn cereal then tossed it with the pretzels as soon as it came out. This worked to keep the pretzels crisp but also allowed them to have the seasoning on them. I had to experiment with the seasoning as well. I tried 3 different types before I found one that I really liked. It ended up being a combination of Worcestershire sauce, BBQ seasonings, and spices. 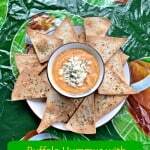 It wasn’t hard to make and I had all of the ingredients on hand but it took a few tries to get it right. The Halloween Party Mix ended up being really tasty. The Cheetos Bag of Bones added a scary element along with a cheese flavor. 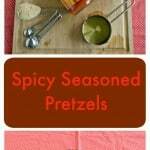 The pretzels added a saltiness as well as crunch. The corn cereal added color and a burst of flavor. 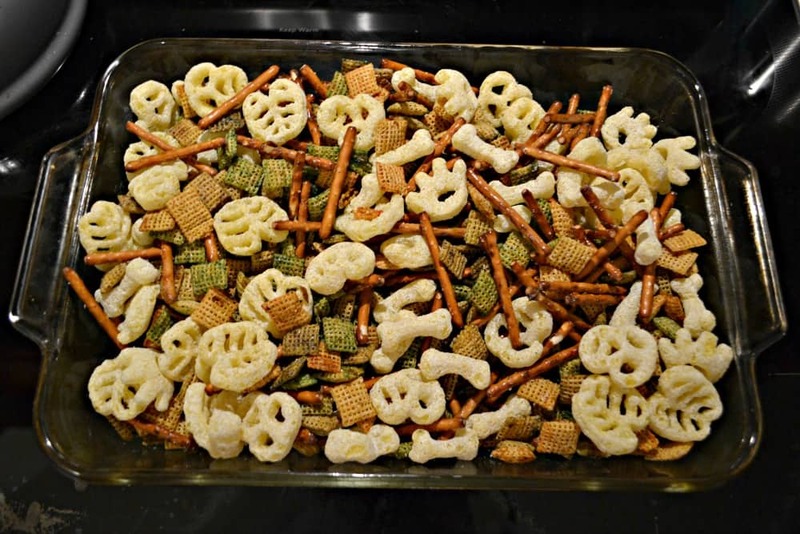 All together it was a tasty and salty snack mix perfect for Halloween. 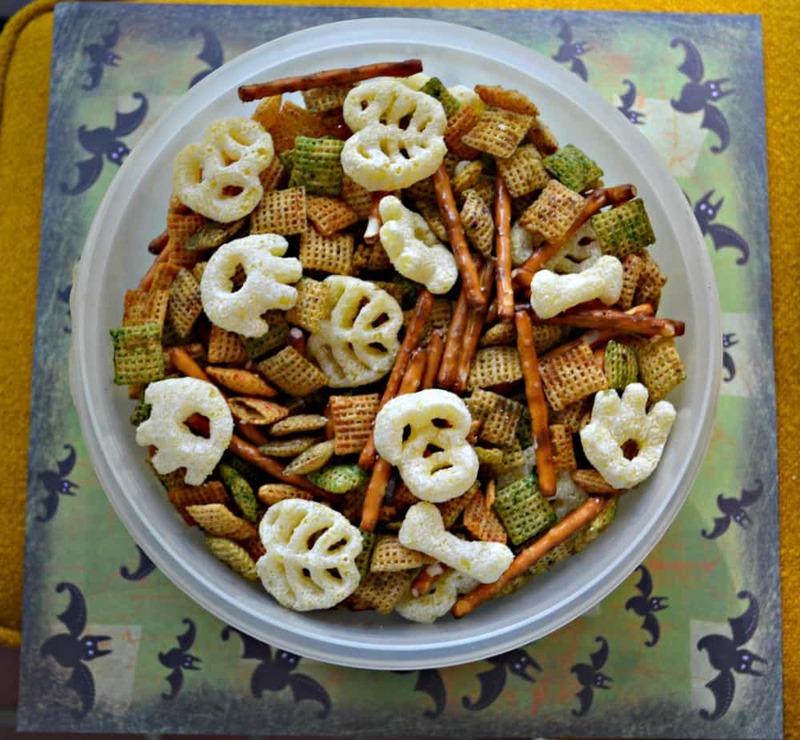 Make your own fun Halloween party mix with 3 simple snacks and a delicious seasoning mix! Preheat the oven to 300 degrees. Spray a 9 x 13 pan with cooking spray. Melt the butter and divide into 3 medium bowls. Add orange food coloring to one bowl, green to another, and purple to a third bowl. Mix well. 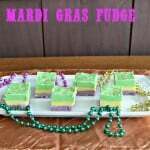 The food coloring will not totally mix in with the butter. Add 2 cups of corn cereal to each bowl of butter and toss to combine. The corn cereal will start to turn the color of the food coloring. 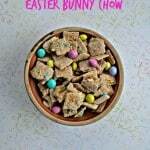 Place the orange cereal on one side of the prepared dish, the green cereal in the middle, and the purple on the other side. Set aside. In a small bowl combine the Worcestershire sauce, salt, pepper, onion powder, garlic powder, chili powder, dry mustard, and BBQ seasoning. Mix well until combined. Pour over top of the corn cereal and gently toss each color of cereal to coat. Bake for 10 minutes. 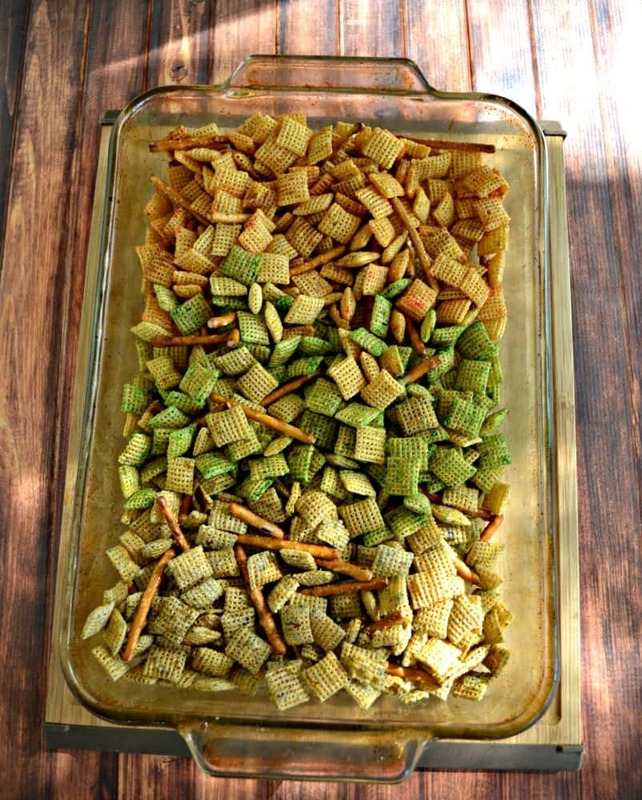 Remove from oven and mix all the colors of cereal together. Bake for an additional 10 minutes. Remove from oven and add pretzel sticks. Toss to combine. Allow to cool for 20 minutes and then add the Cheetos. Toss to combine. Check out these other fun Halloween Foods! Well thanks for going through all that hard work so we can reap the benefits when we serve these up at a Halloween gathering. I appreciate your many attempts to get it just right, and I love the colored Chex. Sometimes it’s strangely hard to find Chex in Canada (they’re here, but never when I seem to want them! ), but I have seen those bag of bones cheetos! Mixes like this are dangerous if they’re anywhere near me! I love snack mixes too!